You’re sitting in testimony meeting. As you watch members of the congregation stand up and bear their testimonies, you feel as though you should too. But what do you say? And what if you start crying while you’re up there? Or what if you don’t start crying? You may begin to question if you even have a testimony. Or maybe you’re unsure of what your testimony is. Here are some guidelines to help you know what a testimony is and is not. “Pure testimony” (Alma 4:19) begins with pure belief. Your testimony is a spiritual witness of what you believe or know to be true (see D&C 80:4). When you share your testimony, the purest and most powerful parts will come from words like know, believe, and testify. If you can say with sincerity, “I know the Book of Mormon is true,” you can have power to change lives and invite the Spirit to touch others. 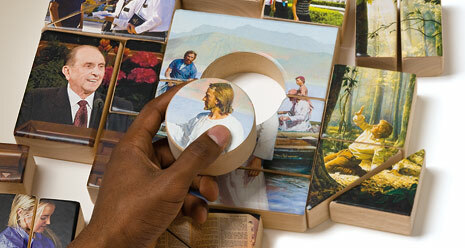 Imagine you have a large box filled with puzzle pieces created just for you. Using the picture on the front of the box, you try to put the puzzle together. When two pieces of your puzzle fit together, you know they belong. Testimonies work in a similar way. As you have spiritual experiences, different pieces of your testimony will start to fit together, and you will come to believe or know certain truths about the gospel. Even if you don’t know right now if everything about the Church is true, Heavenly Father will bless you and help you learn as long as you have a righteous desire to know and you sincerely try to learn. As you work on your puzzle, your family and friends may periodically help you put it together. But in the end, it is your unique puzzle to build and protect. You may rely on the faith of your parents or friends sometimes, but as you have more spiritual experiences, you can maintain your own testimony. As you grow in the gospel, it is important to develop a testimony of your own. Just as two people would have different approaches to assembling a puzzle﻿—maybe one person puts the edge pieces together while another begins matching colors﻿—we each build a testimony through beliefs and experiences in an order unique to us. If you’re unsure about anything, sincerely pray for guidance and truth. Often prayers are not answered in the way we might expect, so keep your eyes and heart open for answers. Just as you can’t take a completed puzzle out of the box without doing any work, you can’t expect your testimony to come all at once. You learn, piece by piece, the truthfulness of the gospel. Maintaining a strong testimony requires constant effort. As you continue to work on increasing your knowledge of the gospel, the Holy Ghost will bless you in your efforts and your testimony will continue to grow. President Dieter F. Uchtdorf, Second Counselor in the First Presidency, “Waiting on the Road to Damascus,” Liahona and Ensign, May 2011, 70. Do I have to share a story or experience when I bear my testimony? People often share stories or personal experiences when they bear their testimonies, and these can be a great way of describing how a testimony grew. But a story is not a testimony. A short, relevant story can help you illustrate a point, but make sure to include how that story enlarged your testimony and what gospel truths you learned from that experience. A testimony is what you know about the gospel, not about where you’ve been or what you’ve done. Also, be careful about the experiences you share. Some are deeply personal to yourself or others, including stories about sin, repentance, and sacred spiritual experiences. Stories like these should not be shared in a public setting unless you feel prompted to. When you do feel prompted, keep them general, focusing on what you learned from the experience rather than the specific details of what happened. Do I have to express thanks or love in my testimony? While it is not inappropriate to express love or appreciation when you bear your testimony, these expressions are not considered a testimony. Testimonies focus on what you have learned spiritually about the gospel. Expressions of love or gratitude should not replace a testimony. Do I have to cry or show emotion to have a real testimony? Many people cry or show emotion when they bear testimony or feel the Spirit strongly, but not everyone has the same emotional reaction when he or she feels the Spirit. You do not have to express emotion the same way as others when you bear testimony. If I’m not sure I have a testimony, do I still try to share it? It’s easy to feel like your testimony isn’t strong enough or worth sharing, but as you share your testimony, you will find how much of a testimony you really have! Do not be afraid to share your testimony. You will find that the more you share your testimony, the more it grows. David A. Bednar, “More Diligent and Concerned at Home,” Liahona and Ensign, Nov. 2009, 19. M. Russell Ballard, “Pure Testimony,” Liahona and Ensign, Nov. 2004, 41. Howard W. Hunter, in Preach My Gospel: A Guide to Missionary Service (2004), 99. Boyd K. Packer, “The Quest for Spiritual Knowledge,” Liahona, Jan. 2007, 18; New Era, Jan. 2007, 6.